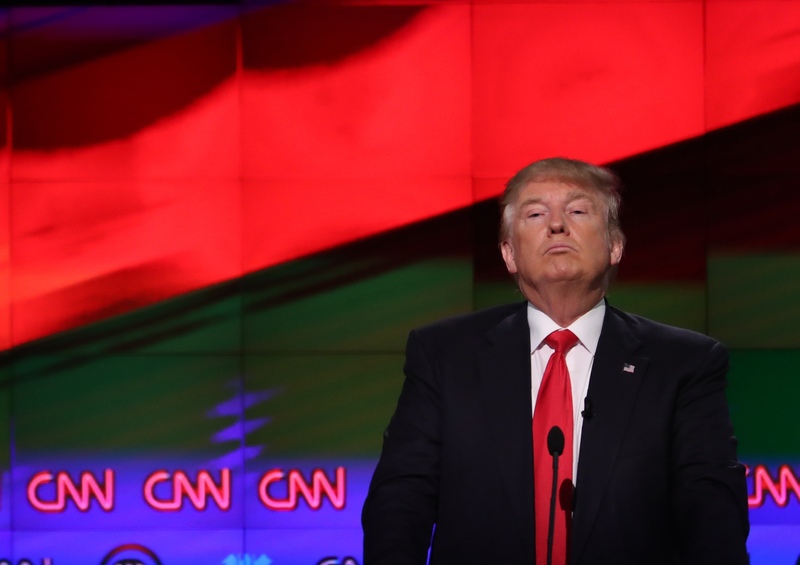 GOP frontrunner Donald Trump suggested at Thursday's CNN Republican presidential debate in Miami that he would be willing to support a massive ground force to take on ISIS. This is a shift for Trump, who has, as a presidential candidate, often portrayed himself as less hawkish than his Republican opponents. Trump made the troop comment in response to a moderator's question as to whether he would follow a military commander's advice to increase the number of ground troops to fight the terrorist group. "We really have no choice," Trump said. "We have to knock out ISIS. We have to knock the hell out of them. We have to get rid of it and then we have to come back here and rebuild our country, which is falling apart." Radio host Hugh Hewitt pressed on specific numbers. "I would listen to the generals," Trump said, "but I would - I'm hearing numbers of 20 to 30,000. We have to knock them out fast." Before Thursday, Trump has often bragged about his reluctance to support wars in the Middle East. "'I was against the war in Iraq," he recently said at a rally in Baton Rouge, Louisiana. "We have to be given credit for vision. I was against the war in Iraq because I said it would totally destabilize the Middle East. And that's exactly what happened." But Trump's position on ground troops has always been amorphous and without specifics. He's even talked about how he has been vague on purpose, saying at a South Carolina rally in December, "I want to be unpredictable. I don't want to tell ISIS what I'm going to do to knock the hell out of them." This was a claim he has repeated many times on the trail and in television interviews. "I think we have to be unpredictable," Trump told CBS News' John Dickerson in January. "Our enemies know what we are going to do, whether it is battle, whether it is war, whether it is finance. You have to be somewhat unpredictable." However, Trump's debate suggestion would mean a massive investment of ground troops abroad - a position that was a big part of South Carolina Sen. Lindsey Graham's platform during his unsuccessful presidential bid. Trump was critical of Graham's foreign policy platform, telling CNN in July, "All I know is every time I watch Lindsey Graham, he wants to bomb everybody." Trump has always implied, since announcing his candidacy, that he would be in favor of ground troops on some level. In an August interview with MSNBC's Morning Joe, Trump said that the United States military should confiscate oil from ISIS-held territories - with ground troops if necessary. "I would knock out the source of their wealth," Trump said. "The primary source of their wealth which is oil. And in order to do that, you would have to put boots - I would knock the hell out of them, but I would put a ring around it and take the oil for our country. I would just take the oil." On the campaign trail, Trump repeatedly has said, to the delight of crowds, that he would "bomb the [bleep] out of ISIS" as president, but has stopped short of calling for a massive infusion of ground troops like he did tonight. Last December, Trump told Fox News, "I would do whatever you have to do. I've been saying on your show for a long time, take the oil, and you know that. I've been saying it very loud and strong for years. I mean, I've been saying it for years. They've never done it." While his support for ground troops has been unwavering, Trump has danced around how much he would invest in a campaign against ISIS. At a press conference in November before a rally in Worcester, Massachusetts, Trump suggested that other countries should take the lead in taking on ISIS and that the United States should only be in a supporting role. "We've got to get rid of ISIS quickly, quickly," Trump said. "Not for a long time. Let me tell you what I really want to do. I want to get other people to put troops on the ground and we'll back them up 100 percent." To this effect, Trump was very supportive of Russian president Vladimir Putin's decision to launch airstrikes in Syria in September. "If Putin wants to knock the hell out of ISIS," Trump said at a Fox Business debate in November. "I'm all for it 100 percent and I can't understand how anybody would be against that." Trump even told Scott Pelley on 60 Minutes, "If you look at Syria. Russia wants to get rid of ISIS. We want to get rid of ISIS. Maybe let Russia do it. Let 'em get rid of ISIS. What the hell do we care?" Trump was then pressed about using ground troops, which he said he was open to using. But in the aftermath of President Barack Obama's announcement last fall that he would send fifty special forces operators to Syria, Trump was critical, saying that the enemy should not have been told specific numbers of ground troops. "We have got to be chess players. You know what we are? We're checker players, and we don't play well. And part of the reason is, we always tell everything. Like, Obama goes -- and he has got 50 people that he's sending over," Trump said to CNN in January. "Why does he have to make an announcement he's sending 50 people? He's sending 50 soldiers, our finest over there to Iraq and to Syria. Why does he have to say that? Why does he have to announce it? Why couldn't he just let them go?...Now they have a target on their back."